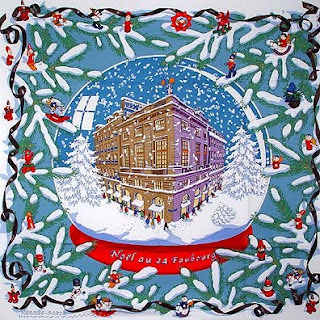 An all-time classic, "Noel au 24 Faubourg" ("Christmas at 24, Faubourg") depicts the Maison's Paris flagship boutique at No. 24 in an apparent snow globe (with the accompanying snowflakes peacefully making their way onto the ground). The globe is surrounded by snow-covered pin tree branches. Of amazement are the ornaments on these branches, in the shape of elves in different poses, some playful, some enjoying winter sports. The ubiquitous - and emblematic - "bolduc" (a thin ribbon or thread, now associated with "gift ribbon") adds a discreet touch while its curls further enhance the spirit of celebration and playfulness - and evoking magical childhood memories. This design, created by Dimitri Rybaltchenko in Fall/Winter 2004 and reissued in Fall/Winter 2006 in 45cm pochette and 90cm cashmere/silk, has been highly popular and a sought-after collectible. A design that triggered a tremendous emotional reaction is "La Musique des sphères" ("the music of spheres"). I love music, and while I'm not a particularly keen fan of the violin sound, I adore the actual instrument, with its delicate and gracious lines - a true personification of femininity and beauty ! An apparent ode to music (it is widely reported that Bach's inspiration for his music was drawn from the harmony of the universe), this scarf pays tribute to the popular belief that music and mathematics share both grace and harmony - hence the mathematical symbols - the water's molecular structure (represented by the circles) and the representation of the Pythagorean theory. 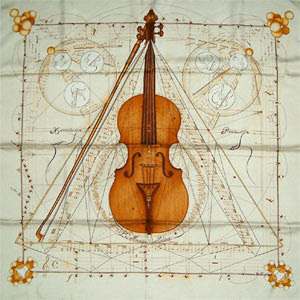 The focal point of the design is the rendition of the exquisite "Viola di Medici", produced by Antonio Stradivari in 1690. The exquisite beauty of this violin (captured vividly and with accuracy on this scarf) makes all those beliefs very credible ! The interesting aspect is that when the scarf is knotted, the enchanting effect is somewhat lost, as the scarf does not convey the same emotion, mainly due to its many lines suggestive of geometric shapes, including the spheres in every corner, which carries one's imagination to a certain intergalactic journey (or perhaps the mollecules inside the human body). While theoretically linked by way of a certain belief that music lifts spirits to heaven, the two concepts - violin and intergalactic journey - do not seem to coexist harmoniously on a scarf, especially when worn. 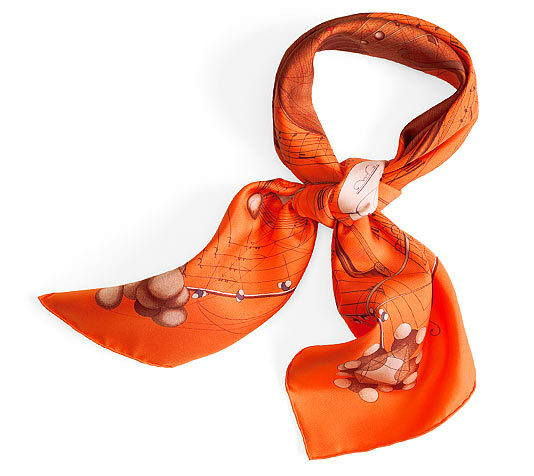 This year, Hermes has released a limited edition scarf with identical design but under a different name - Tribute to Carnegie Hall - and available exclusively in the Madison Avenue boutique. The colour ranges for the 2009 edition are violet and orange only ! I came across this design from 2000 and was captivated instantly by its beauty, simplicity, exquisite details, symbolism and its ability to capture - and express - the individuality of the Japanese spirit. "Every Meeting is Unique" is a tribute to the people, animals and to a certain extent, the things that we come across. 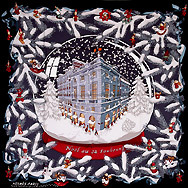 The upper and lower sides of the scarf depict a meeting, possibly between two individuals, possibly between four. Of equal interest are the pairs of cranes, symbolic of Japan, that are united through a magic dance and whose shapes (another allusion to the Japanese art of shadow theatre) are graciously reflected opposite them. 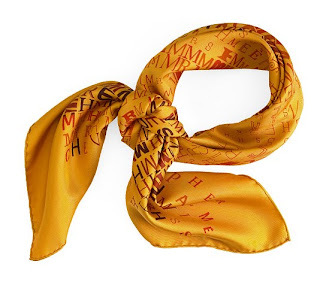 The composition is classically "solar", with the focal point drawn in the middle of the scarf from which emanate towards the edges of the scarf, like sun rays, the elements of the design. This style of drawing has been the foundation of the original Hermes design; the landscape, the Arabesque, have been successfully explored only in the more recent history. I continue to be mesmerized by the beauty of this scarf, and the rich meaning its title and its design carry. I dedicate this scarf to all those who have crossed my path in life, indeed, I dedicate this to all my friendships and also those encounters that, despite our wish, had an immediate unexpected effect on us yet which served to teach us powerful lessons for the many years to come. Soon I'll celebrate my birthday, and so it's only natural that I speak of scarf that depicts a remarkable animal, admired and respected the world over, whose relationship with the human being has flourished over the years, yet now is to be found in only a handful of places (such as the countryside): the noble horse! 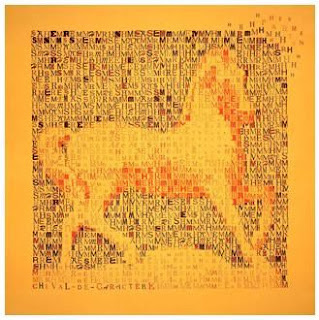 The image of the horse in "Cheval de caractère" ("Horse of Character" - the title bears a double entendre, as "character" in French refers to printed letters) is rendered by the shapes and shades of the five letters that make up "Hermes". They repeat along lines across the entire scarf. This particular orange is very vibrant and balances very nicely the more "mature" design. A spectacular sensorial feast. I find this design particularly impactful for the image it reveals on close inspection (or rather per ensemble, or "from awar") - and thereby likely hidden to the uninitiated eye. I find it equally elegant for the sophistication of the pattern - no longer individual objects, but a series of letters. Since I started the blog, I seldom came across instances where this scarf became available for sale - but never in this colour combination, which is a strong testament to it appeal.